Hello all! 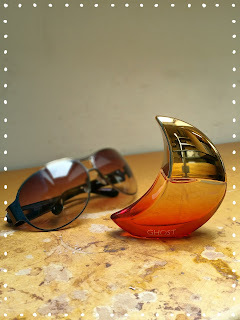 Today I'm bringing you my summer scent, Ghost Eclipse. A lovely fruity/floral light perfume which reminds me of long hazy warm summer days. I do so love that bottle, everytime I see it I think of summer with that golden ombre sunset. Ghost have a good line-up of everyday fragrances, and seem to have something for almost every preference. Normally I like a more masculine spice to my scent, but this is so warming I do enjoy it during the summer months. To me it smells like warm skin that's been out in the sun, combined with a citrus fruity element, (much like a good cocktail on the beach!). It is a lighter scent, and won't last all day, but at £16.49 (here) ,[normally £25 for the 30ml set], you don't mind so much. Using as a set with the body lotion does make the scent last that bit longer too. The bottle size at 30ml means you can throw it into your summer bag, and top up whenever you want to. Seriously handy if you're looking for a mini-break hand luggage fragrance. What about you guys? Do you have your own signature summer scents? Or do you change them year on year with each new launch? Those Ghost bottles are just so mystic and cool! This one truly does remind one of a beautiful Summer sunset over the beach. Right now I'm enjoying "Eau so Fabulous" by Isaac Mizrahi. It's a mango/osmanthus scent, very fruity, juicy and fresh. It's a hot summer day in a bottle. Great post! Library scented candle... Need I say more?